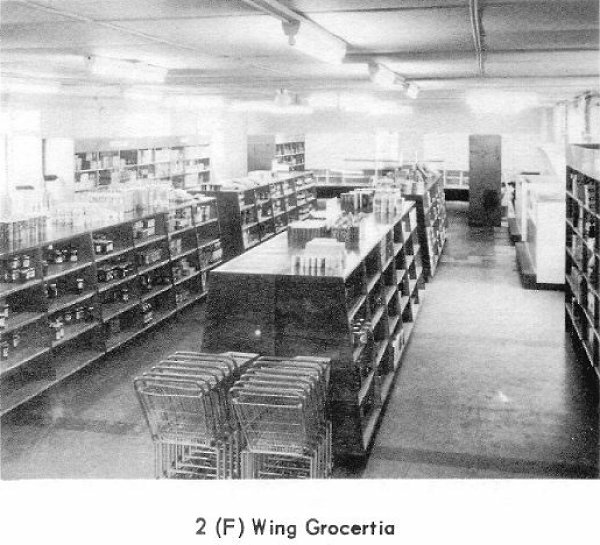 Extracts from 2 Wing Historical Reports pertaining to the Snack Bar, PX, Newstand, and the Grocery Store. 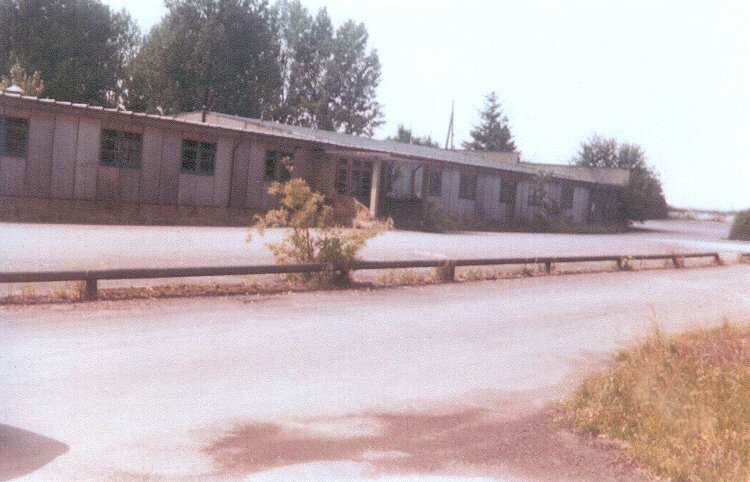 An exterior view of the building which housed the Snack Bar and PX facilities - 1978. 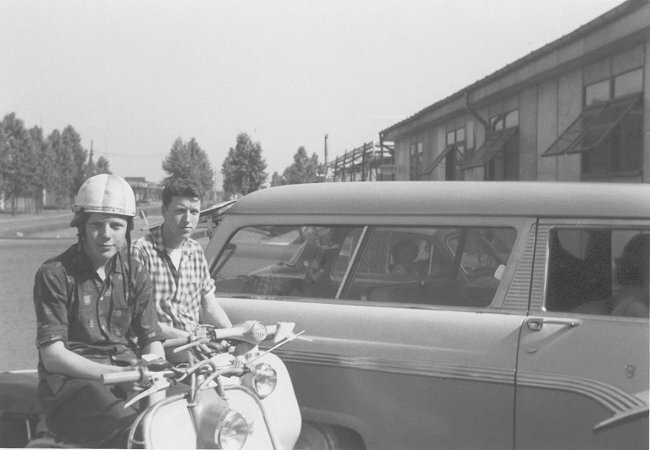 Gary Davis and Jack Graham on their mopeds in the PX parking area - June 1960. 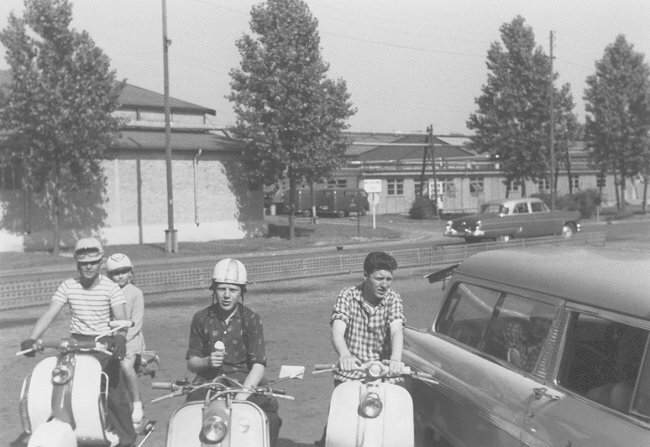 (L-R) Unknown, unknown, Gary Davis and Jack Graham on their mopeds in the PX parking area - June 1960. 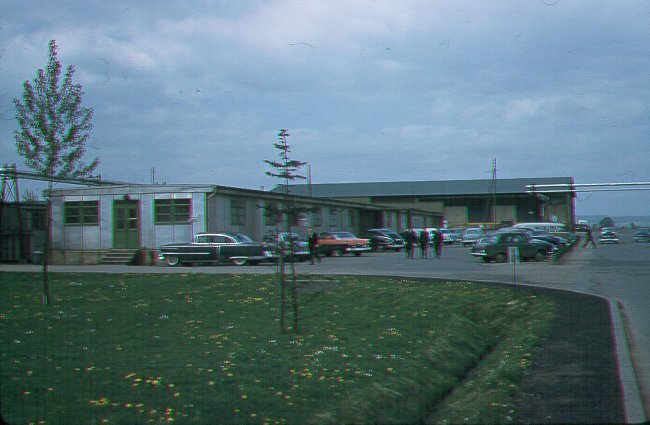 Snack Bar and PX facilities on the left - April 1959. 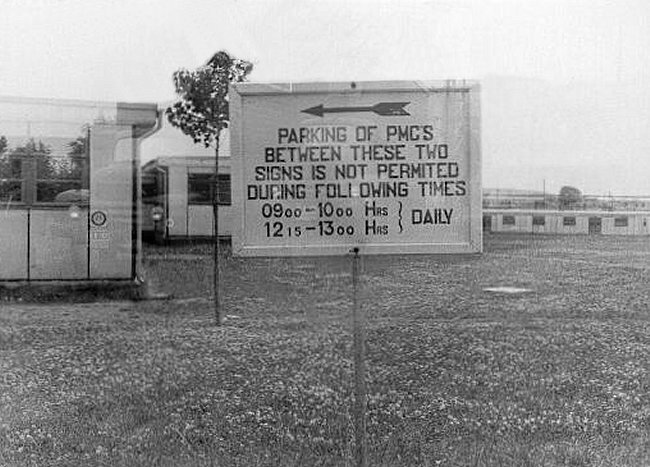 No parking sign located outside of the PX - May 1955. The following detail has been extracted from a 1957 copy of the "Be a Good Canadian Overseas" booklet. Snack Bar - You will find the inevitable snack bar where it is possible to order a cup of coffee, soft drink or a complete meal to satisy your appetite all at reasonable cost. 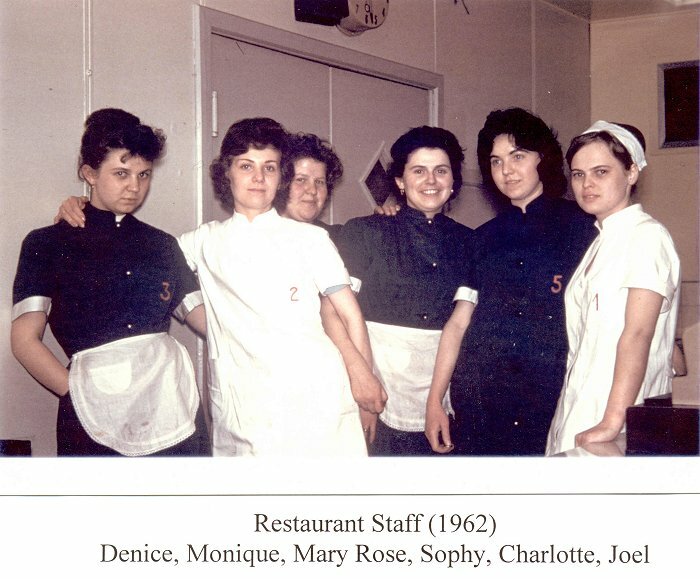 The girls (one of two shifts) that worked at the Snack Bar - October 1962. (L-R) - Unknown, Petit Simone, Grande Simone, Marie Antionette Simon (who later became my wife), unknown, Charlotte, Eddie, Marie Rose, Jeannine. Unidentified PX Manager (standing at rear). Courtesy James Bryant. 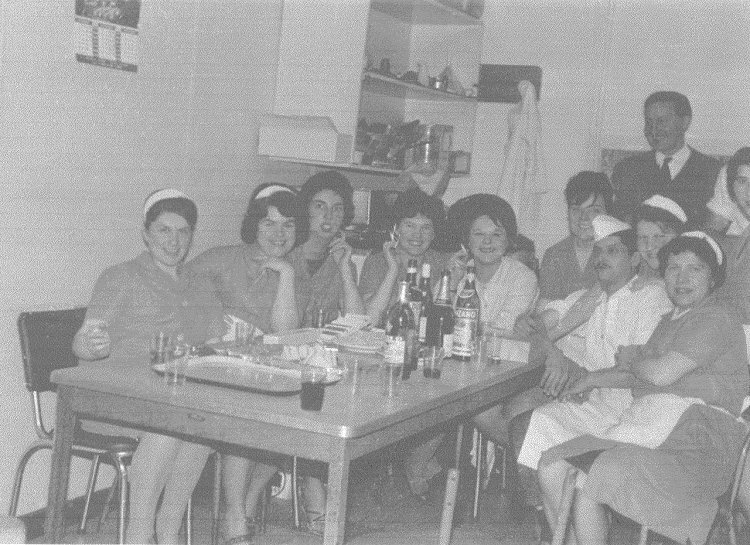 Some of the girls that worked at the Snack Bar - June 1962. 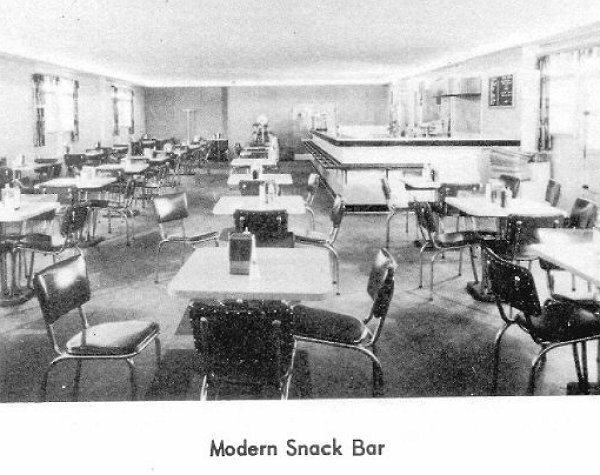 Interior view of the Snack Bar - June 1957. 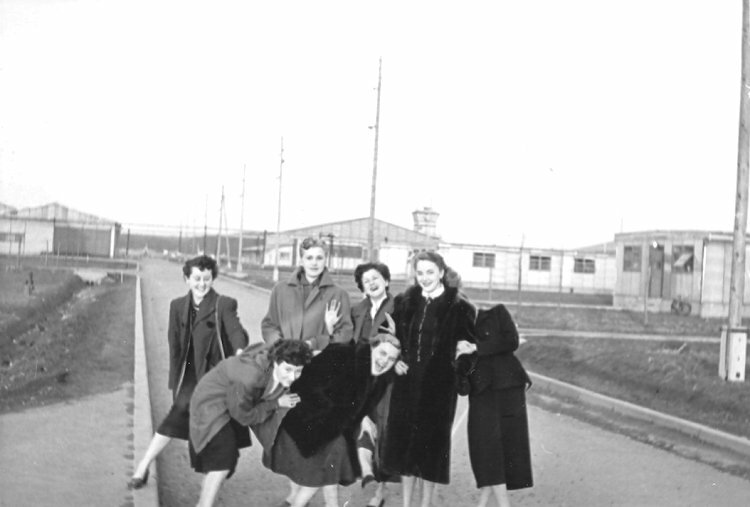 The girls that worked at the Snack Bar - October 1954. Back row (L-R) - Unknown, Nina (my wife), unknown, Marie Therese, unknown. Front row (L-R) Monique, Marie. 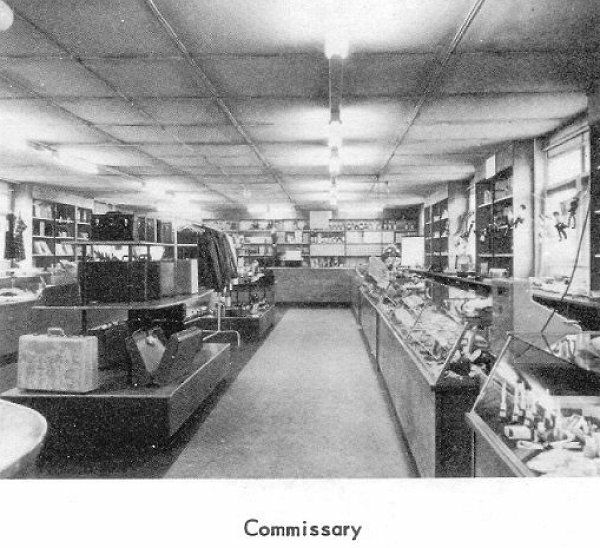 Commissary - Drugs and sundries, cameras, watches, jewelry, radios, electrical appliances, certain types of clothing, a limited line of children's clothing and numerous other small items are stocked in the PX section of the store. Certain tax free goods are rationed. The cigarette ration is one carton per serviceman per week (200 cigarettes) or one half-carton per dependent. Liquor is rationed at two 26 oz bottles per person per week, if married and living out, if single when proceeding on leave. Entry to this establishment is permitted to all service personnel and dependents, showing proper identification. 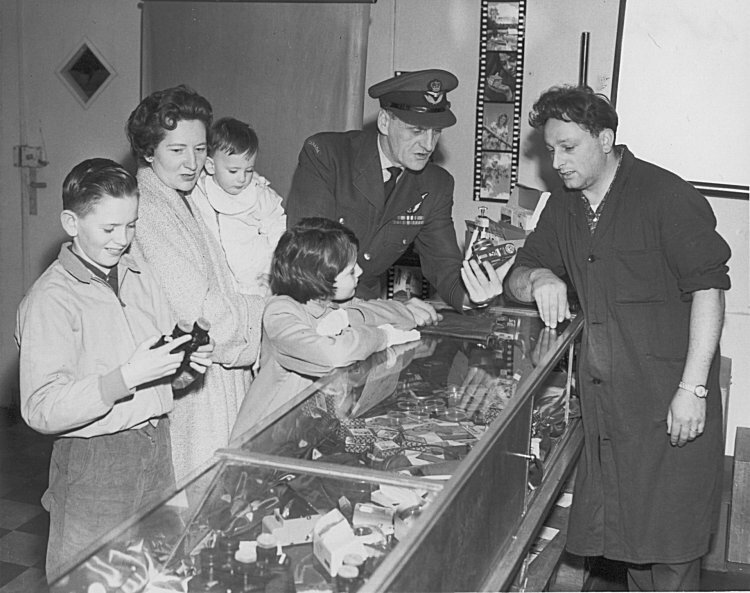 F/L Vic Heyes and family checking out the crystal in the PX - April 1963. 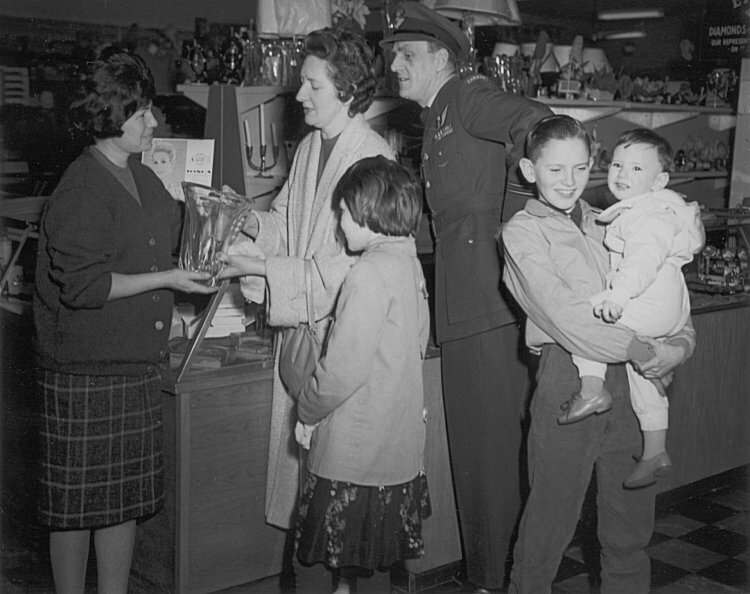 F/L Vic Heyes and family at the camera counter in the PX - April 1963. 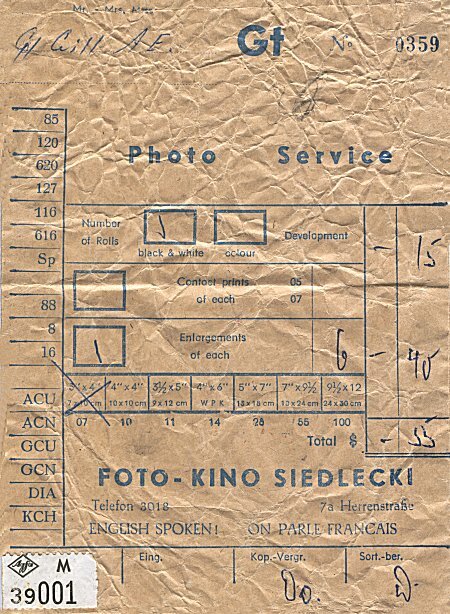 Front of 1 Air Division RCAF "Ration Card" - January 1963. Inside of 1 Air Division RCAF "Ration Card" - January 1963. An interior view of the PX - 25 July 1961. Photo envelope from the PX - October 1958. 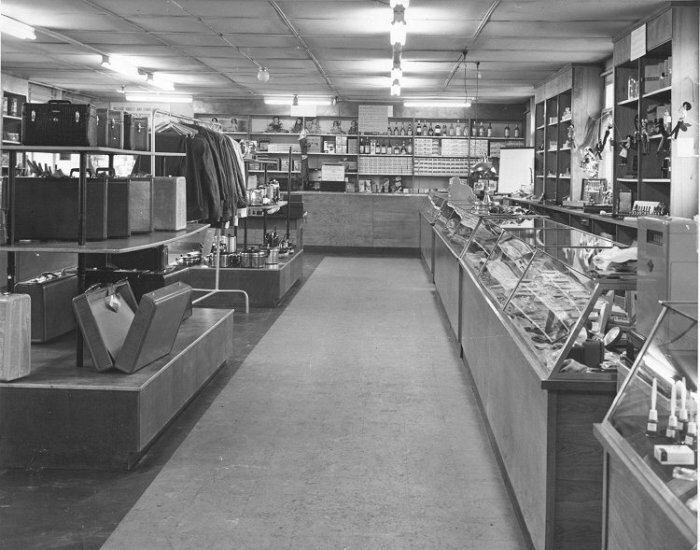 Interior view of the Commissary - June 1957. An interior view of the PX - May 1954. Newstand - At the newstand, it is possible to purchase the latest issues of American magazines, pocket novels, bounrd books and children's books. Daily newspapers are available, and European editions of the New York Herald Tribune and London Daily Mirror are sold in the Airmen's Mess Hall daily from 1630 to 1800 hrs except Sundays. The New York Herald Tribune is also delivered to PMQs. 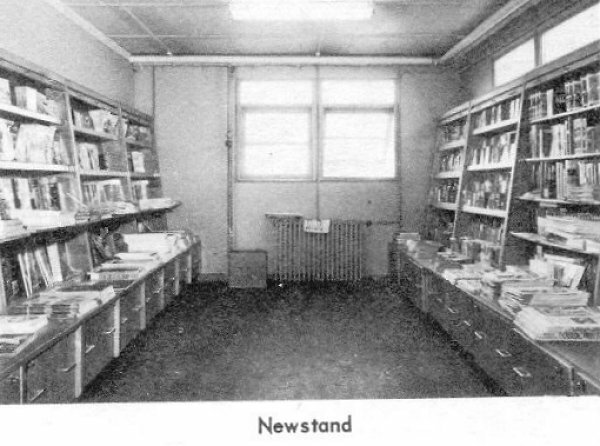 Interior view of the Newstand - June 1957. Grocery Store - A grocery store is located on the station and maintains a wide variety of articles. It carries a reasonably large line of canned goods, babt foods, packaged cookies, baking ingredients, frozen foods and most other items one expects to find in a grocery store. Dairy products are stocked and fresh meat is available in the station butcher shop. It might also be mentioned that bread and milk deliveries are made to PMQs and certain local merchants make regular calls with a good supply of fresh produces. The meat counter in the grocery store - 1963. 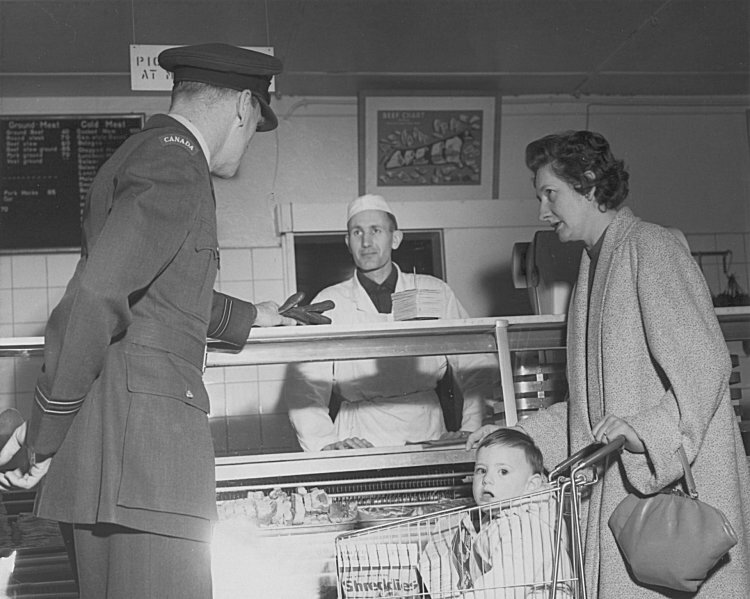 F/L Vic Heyes with his wife and their youngest child checking out the pork chops. 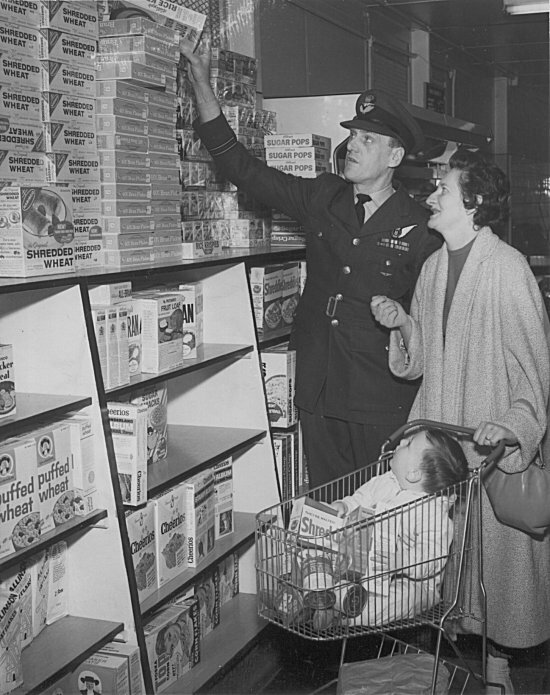 F/L Vic Hayes and his wife shopping for groceries - 1963. 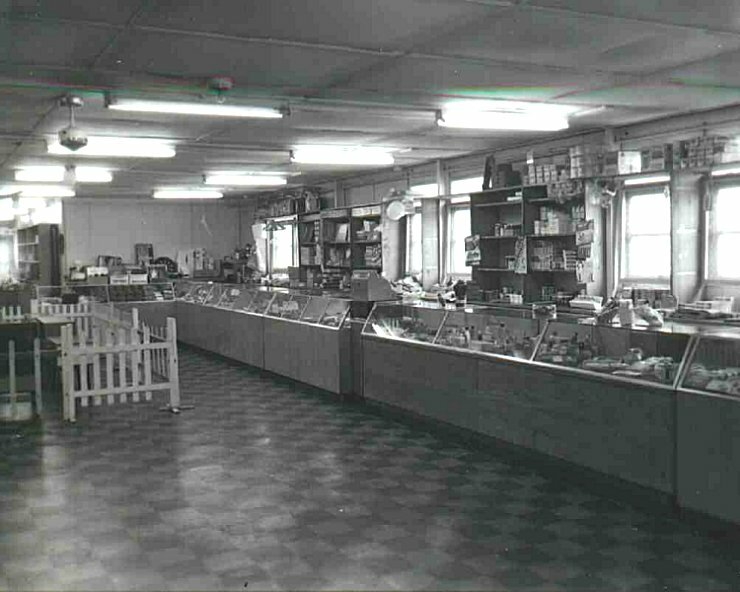 Interior view of the Groceteria - June 1957.